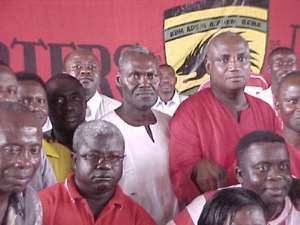 Kumasi, April 26, GNA - The Board of Directors of Kumasi Asante Kotoko Football Club has expressed dissatisfaction with the standard of play exhibited by the team in their second leg CAF champions league match against Asec Mimosa Abidjan on Sunday and it has therefore mandated its technical committee to look into the issue. Even though the match ended nil-nil with a goal that was disallowed by the Burkinabe referee, Kotoko was saved from being eliminated from the competition because of the away goal they scored in the first leg in Abidjan two weeks ago. A release issued in Kumasi on Monday and signed by Mr Kwame Boafo, the Board Secretary copied to the GNA Sports noted that the performance of the club in Sunday's match posed a great danger to its ambition of annexing the Champions league title. It said the Board mandated its technical sub-committee to meet the management of the club on Monday to ascertain the reasons for the poor performance and explain for the sub-standard performance exhibited by the team for consideration. Upon being furnished with a report on the meeting, the Board will then consider it and take the appropriate steps to stem the fate of decline in the standard of play of the team of late, the release said. The necessary action will then be taken with dispatch to ensure that the club's participation and especially its next assignment in the Champions league was not jeopardised.